Wow, The more I dig deeper the more I am amazed by how strong Jesus’s words were about this subject. For those who come to Him, His love is refreshing and satisfying but to those who reject or live as an apostate, the words are fierce. It has opened my eyes to more subjects to write about. I must warn you that the reason I write about this is not to create a cause, which could turn into an idol, but to remind everyone that we are all pieces of puzzle. Some of us are edge pieces and some are in the middle, but we are all connected to form a picture. I write in fear and trembling of the Lord, because I do not want to mislead or manipulate His Word or misrepresent the revelation I am experiencing. As we go through this there are two sides, what Jesus said and did and what He requires from us. Our silence in many cases is an action that has dire effects.This is a heart issue once again. When that moment comes for you to stand in opposition to evil or tell someone the truth of a situation will your prayer stem from desperation and “hope” God will intervene or will it stem from your faith and a Fear of the Lord. Will you allow the Holy Spirit to lead, guide and direct you in the face of rejection to carry His truth upon your heart? What will you say to person going through a divorce? Will you pray for them that it will all work out according to God’s will or will you confess that God wants their marriage to work? That we need to honor our covenants. Sometimes a marriage needs someone to tell the couple to take the “D” word off the table and put God on the table. If there is infidelity, will you confront the sin and the effects of the sin to save the person from more damage? Will you request that the infidelity needs to stop and pray together for changed behavior? Or will you agree with modern-day rationalization that you don’t know the whole story and it is not your place to say……..anything? What will you say to your friend or acquaintance who is dabbling in New Age mumbo jumbo, crystals, spirit guides etc… in hopes of finding answers to the issues they face. Will you put them on your private prayer list and not say anything or call it out at that moment and tell them that they engaging in witchcraft and need to turn from it and call for Jesus into their heart. If your deepest answer is that you are afraid to say something because it might not be your place, that ship has left port. There might be a deeper core issue, want to know what it might be? If you are unwilling to step out and ask someone about their issues, more than likely you don’t want anyone asking you of yours. If this is the case, the faith you believe you possess is a facade. That is the essence of the coexist message, we don’t want people calling us on our crap so I won’t call them on theirs. However if you want to walk in with Christ and get closer, that which is in the dark must be brought out into the light and that doesn’t happen if we remain silent and coexist. Yes, you will more than likely ruffle a feather or two, but who are you impressing and what is the end game? The idol here is free will, and many will fight for it even in their Christian beliefs. Jesus himself said that the Holy Spirit was sent to abide in us, It was not sent to be placed under wraps like the servant who buried his talent. 9 “But be on your guard; for they will deliver you to the courts, and you will be flogged in the synagogues, and you will stand before governors and kings for My sake, as a testimony to them 10 The gospel must first be preached to all the nations. 11 When they arrest you and hand you over, do not worry beforehand about what you are to say, but say whatever is given you in that hour; for it is not you who speak, but it is the Holy Spirit. Why would Jesus say they would deliver us into courts, certainly not for keeping quiet? However, today the threat of legal action silences a generation and we don’t even give the Holy Spirit a chance. We are afraid of what we will lose. We hold the laws of man in higher regard than God. That is evident by our fear of legal action to shut us down. We believe these laws are more powerful than God. What that shows is our lack of faith and since we do not walk in Fear of the Lord, we don’t acknowledge His majesty. We hold more precious the things of this world instead of weighing out that which is spiritual. Laws consistently try to change our influence legally by shutting us down. We try and follow those rules so as not to get in trouble and we play the shell game with Satan. And while we play into Satan’s scheme’s we are not focused on God’s desire for his people. That is what I mean by a cause, we play in the legal world while this is a spiritual one. We are still called to destroy the altars of false gods and remind a people what will happen if we don’t. Jesus came to set the record the straight, not keep silent. He is love AND He is just. You are hated as a Christian and nothing you can do will change that. Each time we try to soften the message to attract more people to Christ that message is diluted. Each time we hold our tongue so not to offend the message is diluted. When we try to appease everyone and build Christian Community Clubs disguised as churches; the message is diluted. When you prefer to be surrounded by life coaches poising as pastors; the message is diluted. When you are attracted to what you want to hear; the message is diluted. When you prefer to be entertained on Sunday for an hour there is no message!!! Who is talking about repentance? Who is talking about purifying our personal altars so we can be a fragrance that Jesus recognizes as the bride of Christ? Who is talking about a groom who gave His life to protect His bride and will keep her safe throughout eternity. Who is taking about how God allowed His judgment to fall on His Son so we wouldn’t have to be condemned? Yes, Jesus can talk about what will happen, if you do not turn towards Him, because he took on your sin. At that moment the keys were snatched away from the devil and you had a choice. Oh, but we hear, “You Christians think you are better than us, with all your Holiness!! !” Then we cower and say oh I am sorry. I shouldn’t be so bold it might hurt someone feelings and they may never find Christ. Maybe it should be attraction over promotion. We then try to modify our message to soften it a bit and hope the naysayers will approve of the message we preach, all the while the message we should be preaching turns to a sugar daddy god. Some of us might remember a time when the threat of getting spanked when our father came home was enough to keep us in line. Same principle different application. Today we are told God is like a grandfather who will spoil us and as long as we keep trying and all will work out for the best. That is not what Jesus said. It should be truth, attraction and promotion. But the person you are talking to might feel the Spirit of God on you and the Holy Spirit is convicting them with fear and trembling, just don’t acknowledge the accusation that their soul is yelling out which confirms their lie, acknowledge the fruit of your spirit to their spirit. You are the testament of Christ standing before them. Or, the truth be known, if you are not Holy unto the Lord, you might not want people talking into our life, even the person you are talking to about something you see about them. Their argument might be a conviction you need to hear and confess. John who spent 3 years with Jesus and was even termed the Friend of Jesus, could actually call himself Jesus’s friend said this. In Revelation 1, It was hardly a “what’s up buddy” encounter. 17 When I saw Him, I fell at His feet like a dead man. And He placed His right hand on me, saying, “Do not be afraid; I am the first and the last, 18 and the living One; and I was dead, and behold, I am alive forevermore, and I have the keys of death and of Hades. With a Fear of the Lord you are safe and God’s hand will be upon you. The purpose of judgment is to instill in his people, a Fear of the Lord. and an understanding that God is in charge. In today’s world the Fear of Lord seems nonexistent. Churches entertain which is Satan’s substitute for joy. We are not taught about God’s Kingly side in many of our Churches, so when we see and hear in every direction that all points of view are equally valid and everyone should play in their own sandbox, we disagree and nod our heads in the pews, but remain silent once we leave or only discuss this amongst our close friends. While coexistence is preached as an honorable modus-operandi the underlying motives are leading people everywhere else but to Heaven, even the children sitting next to us in church. Satan does not play fair, every argument seems reasonable and at every turn we relent and allow the doubt to take root. Search your heart on this, I have and I confess I held these views before and did not walk in a true faith. 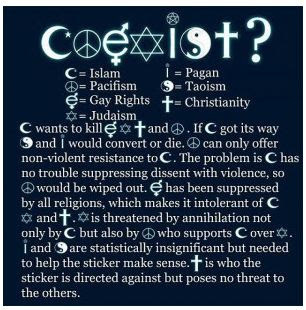 The coexist bumper sticker always chafs my hide when I see it, because the person in the car, doesn’t have a clue of where they are headed with a belief system rooted in this mindset. I went to one of the websites to get an explanation of each term and what was interesting is that Christianity is last with a question mark next to it, when it is the actual answer. Even for this schtik it should be a period at the end. Why is that, because doubt is the seed being sown and if there is doubt there is no Hope. The point that is consistently driven is that other beliefs seem to have more validity and earthly power over the Truth Christianity presents. Do you make a difference in your sphere of influence or walk away and pray for them silently. Which is not wrong, but did you leave the message the Holy Spirit imparted on to you. Did you tell them what will happen if they do not turn to Christ? Or are you afraid to say that part? There is a day of reckoning coming some will go to the left and some will go to the right? On Calvary there were two criminals one on the right and one on the left, one was saved and one was not. The one that was not saved didn’t demonstrate a Fear of the Lord. I guess everything was not permissible. You see how close you can be to God and still miss the boat. When Jesus spoke to someone it was at the crux of their spiritual dilemma the rich man, the woman at the well, the adulteress at the stoning or the people at the stoning and the robber on a cross next to Him. Did He leave them with a half an answer or a partial statement. No, He wrote it on their hearts to a point they took it or rejected it completely. He did not mind his own business and hope everyone would find their way to Him eventually, shrug his shoulders and say, “I did my part.” He brought them to the crossroads. He took them to edge of that person’s heart not their intellect. In Luke 9 and 10. He gave the disciples clear direction and told them to shake the dust off their feet if they were unwelcome and they were to curse the town. This is not an opinion on what I think Jesus said, it is what He instructed them to do. There was no shrugging of shoulders and saying , “Oh well.” Jesus welcomes us and warns us, In Mathew 10:17-18, he even says that it would be more tolerable for Sodom and Gomorrah than those that reject or not take heed. So, what does this all mean? It means we need to take the messagein the midst of all the cultures and opinions and not coexist. We must not allow the lies or the half truths about Christ to be continued while we do nothing to demonstrate, through our faith, the power of God. If we do not call on it, how can we stand firm in it. If we entertain the doubts spoken by those who are hostile to God and let them permeate our thoughts, we will not walk out the Great Commission and waste-demean our spiritual authority that has been given to us. More and more Christians, acknowledge they are believers but live and demonstrate they walk in fear of man not God. Christ stood, and stands for you, when he overcame death, he took death away from all of us, who believe in Him. If you believe that, then you will not coexist, you will walk out your belief and it will be demonstrated to everyone around you. We need to stand firm in our belief and speak the truth to those that still want to kill Jesus. Coexistence is what is needed because Christianity is judgmental. Nothing is right or wrong and all paths lead somewhere and your God can’t be the only way if He is loving like you say he is. It does not make sense that your God would condemn you to Hell for eternity for such a short time on Earth. All reasonable arguments, but the truth doesn’t change. But I am afraid it is code for everything is permissible and valid but Christianity. There is a Heaven and a Hell and what you do on this Earth in your life, and how you walk that out, determines your fate and God is the judge. Christ bore your sin and has your had your charges dropped. All you have to do is say Yes, Lord. But when people want to diminish the truth about Christ, many naysayers call on the priestly side of His character to play into the kind nature of (many) Christians to perpetuate false truths or keep the truth under wraps. We are told to not judge lest ye be judged, but they readily ignore the other million words in the book and completely take those few out of context. It never said not to judge, but the point is that you had better be ready to stand under the fire of judgment if you do. While we are told by the secular world not to judge over an over, the lie has taken hold and we are being judged as hypocrites those who say “we” shouldn’t judge. While most Christians look for everyone to play fair and hope to graciously convince them of God’s true nature, we have removed the judgment seat from all conversations which would convict them to God’s true nature. The enemy doesn’t play fair and will use any means necessary to take you out of the conversation. So does Jesus coexist? No, He never built his own sandbox to play in, he jumped into the middle of everybody else’s. This entry was posted in Apologetics, Uncategorized by Roland. Bookmark the permalink.